Relationships are key: family ties defined relationships for the Ojibwe and Dakota, business relationships did the same for the whites. The striking contrast between these worldviews is the subject of the exhibit. 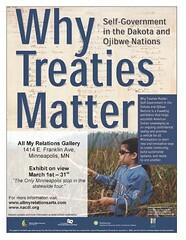 This week is the last chance to see the exhibit at All My Relations Gallery, its only stop in Minneapolis (although it will be at Fort Snelling May 1-30). The statewide travel schedule, the story of the exhibit’s development, and additional materials are available here. The exhibit is sponsored by the Minnesota Indian Affairs Council, the Minnesota Humanities Center, and the National Museum of the American Indian. Find a way to see it–you’ll learn something valuable! Today’s blog post is by Ann L. Burckhardt, a former reporter, columnist, and editor for the Taste section of the Star Tribune. She has written or edited over twenty-five books on food, including the original edition of the popular Betty Crocker Cooky Book as well as A Cook’s Tour of Minnesota and Hot Dish Heaven. Many thanks to the creators of the marvelous Mad Men series for focusing attention on the 1960s, sometimes called the Soaring Sixties. In the early part of the decade, especially, our country’s optimism was soaring and Americans were merrily buying houses and cars and having babies. My own memories of the era are clear. Married three years, we bought a house in 1960. It was a bungalow with a well-equipped kitchen just steps from the dining end of the living room. At last I could entertain friends for dinner, something impossible in our previous home, an apartment with a kitchen I could barely turn around in. Also in 1960, I was promoted to Cookbook Editor at Betty Crocker Kitchens, General Mills, Inc. I traveled to national meetings , which featured one groaning board after another as new products by the likes of Kraft and General Foods were presented. Best of all was my annual trip to New York City to approve the pages of the latest cookbook before it went to press. The editors took it upon themselves to introduce this daughter of small-town Iowa to the best of New York’s eateries—on the expense account, of course. Most spectacular was the fabled Forum of the Twelve Caesars. My then-husband and I formed a gourmet dinner club with three other couples. Not gourmets in the caviar-on-toast sense, we savored an excellent meal and squeezed our budgets to sample the foreign (German and French) food at well-known downtown restaurants. The club met every third month, with one pair hosting a sit-down dinner: crystal, china, the works. Unlike Don Draper and friends, we served neither pre-dinner cocktails nor wine with dinner. The hosts prepared the main course; others filled out the meal: appetizer, vegetable and/or salad, and dessert. The main course was often a nice big roast. Vegetables were gussied up with sauces. Whipped cream–laden desserts were the climax. Dinners for four or six at home alternated with potluck suppers at our church and with coworkers at our local theater group. We sought potluck recipes that were economical while being portable, hot dishes we could keep warm in a low oven (this being pre-microwave days) til serving time. Occasionally, on weekends, there were luncheons planned to fete a bride-to-be or an expectant mother. 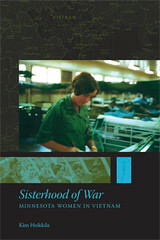 At these, we served what the men (not included!) called “ladies food.” This meant ribbon sandwiches, creamy mixtures in ramekins, fancy salads, fruit in melon boats, tiny tarts or petit fours, and cups and cups of tea. For a taste of the sixties, please try these two recipes from my Hot Dish Heaven, one of the 2006 New York Times notable holiday cookbooks. A delicious vegetable for a dinner of roast beef, pork, or chicken. Heat oven to 350 degrees. Cut squash in half; remove seeds and pith. Bake squash cut side down in shallow pan 45 to 60 minutes or until fork tender but not soft. Remove squash skin and cut into 1-inch cubes; store rest of squash for later use. Place squash cubes in 1-quart casserole. Sprinkle with onions. Stir cream into sour cream to thin it. Pour cream mixture over squash; toss to distribute evenly. Season with salt and pepper. Bake uncovered 20 to 25 minutes, until steaming hot. Makes 4 servings. Perfect for a shower or bridge party or your own “Return of the Mad Men Series” viewing party. Heat oven to 350 degrees. In a small bowl, combine the mayonnaise, lemon juice, Parmesan cheese, and salt; mix well. Combine the turkey, celery, bread cubes, water chestnuts (if using), almonds, and onion in a large mixing bowl; add mayonnaise mixture and toss well. Transfer mixture to a buttered 1 ½-quart casserole dish. Sprinkle crushed cereal around periphery of the dish. Bake uncovered 40 minutes, until hot through. Makes 6 lady-like servings. Brenda Child and Michael Witgen, authors of two recent books on American Indian history, will share their research and perspectives on Friday, March 30, at an event hosted by Birchbark Books at St. Paul’s Episcopal Church in Minneapolis. Holding Our World Together: Ojibwe Women and the Survival of Community details the ways in which women have shaped Native American life from the days of early trade with Europeans through the reservation era and beyond. 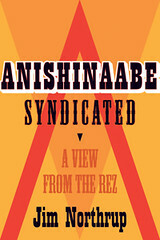 Author Brenda Child is a member of the Red Lake Ojibwe Nation, associate professor of American Studies at the University of Minnesota, and a member of the Executive Council of the Minnesota Historical Society. 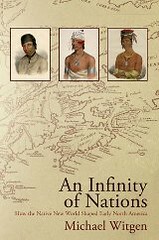 An Infinity of Nations: How the Native New World Shaped Early North America explains that most of the continent’s indigenous peoples were not conquered, assimilated, or even socially incorporated into the settlements and political regimes of the early European colonies of the Atlantic world. Instead, Native peoples forged a New World of their own. Author Michael Witgen is the Director of Native American Studies and an Associate professor in the Department of History and the Program in American Culture at the University of Michigan, and he is a member of the Red Cliff Band of Lake Superior Ojibwe. 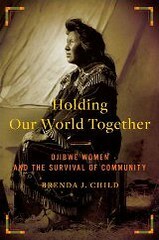 For more information on Holding Our World Together, see the Indian Country Today review and author interview or listen to the audio interview with Brenda on MPR. Mark Anthony Rolo is an enrolled member of the Bad River Band of Lake Superior Chippewa. He is the former editor of The Circle newspaper and Washington D.C. Bureau Chief for Indian Country Today. 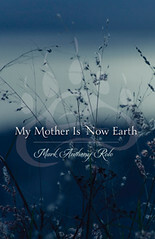 We asked him about how he came to write his new book, My Mother Is Now Earth. How did you decide to write about your mother? Actually, I never wanted to write about my mother’s life for a few reasons. The first is that I was just a boy when she passed on. There are only so many memories an eight- or ten-year-old boy can gather. And of course, the boy of me had a very limited understanding of the harsh realities of poverty, growing up in a home with a mother who struggled with depression and a father who was lost to drinking. My mother was extremely private. She shared very little things of her heart. Much of that was because many American Indian women of her generation were the same. The work of survival is always cloaked in social and personal invisibility. So I had little to reveal about a mother who hid her heart. How could I know it? Even my father and older brothers were often puzzled in trying to understand her. But the other reason is that given we came from such a tough, dysfunctional reality, and that all of us, the sons and daughter, have tried to move on, to remove the pain, to keep the good memories alive, I always felt it invasive to write about those last three years of our mother’s life because I never wanted to “exploit” the shared story I have with my siblings. Of course, I never gave much of this any thought in depth until I met Ann Regan, my editor at Borealis Books. When I was editor of The Circle in Minneapolis, Ann and I used to have rich fellowship when we met for lunch–talking about potential Native American stories that might be appropriate to for the press. Naturally, she was very interested in Native American memoir. And she often wondered if I would ever be interested in writing one. I began to consider her interest, but after given it much thought I decided I just could not tell even my own story because it was so woven into the tapestry of my collective history with my family. So why did you decide to embark on this journey of telling your mother’s story? In the winter of 2008, I was living in Madison, teaching at the University of Wisconsin and taking care of my high school nephew, Nicholas, I used to walk through this community garden across the street from our apartment. I was just moved by the slumber of winter. And I kept visiting that garden until the spring was in full bloom. One day I honestly felt my mother’s spirit in the warm wind, felt her presence within the very living, coming alive, Earth. It was through embracing this wild, wonderful sensation that she was, in fact, one with the Earth, as many–if not all–American Indians believe, she was there and so was her story. I stayed in that “Earth spirit,” if I may, and began the book from that dreamy, lyrical reality. It gave me an opening into the story. It brought my personal memories of my mother and those final three years in northern Minnesota to life. Often, writing the memoir is cathartic for many writers – a process of sifting through unresolved emotions, experiences that lead to making sense of one’s history. Was this true for you? Indeed, there was a great deal of coming to terms with the unresolved. I lost my mother quite suddenly. I was a boy. I never knew her beyond the year of her death, 1973. The grief and the painful, painful work it does in us when we lose a loved one was forced upon me. I have never been one to bury pain by hiding in my work or in play. And I’m forever grateful that I can’t avoid pain. I must feel it, embrace it. And in the many years since my mother’s young passing on I have worked very hard at understanding me, understanding how my childhood has affected my adult self. There is great freedom and healing when an adult finds the courage to undo the past in order find change. Therefore, in approaching my mother’s story there was no grief to return to. 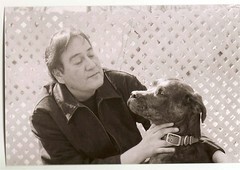 The loss of her and its impact on me was complete–had been for many years. Sure, there was sorrow and much pain in reliving those final three years, but at the same time, the sorrow was surpassed by this uncanny realization that as I pressed on in the writing I felt like I was getting to know a woman who was taken from me at such an early age. I honestly believe that I have gotten to know my mother and her hidden heart. Amazing. To think one could get to know a parent beyond the grave is more than healing. It is, as we Indians say, full circle. Given the trepidation and quite frankly, very real fear of “exposing” your family’s’ story how did you resolve the dilemma of writing this memoir? First of all, my father passed on in 1989. I would not have attempted to write this story if he were still alive today. Like everyone, of all classes and races, Donald Rolo was quite complex. He could be loving and vicious, defender and attacker. I know he loved my mother deeply and thus, the tragedy of their relationship. But as much as I could attempt to convince him that this story was my own story, about my own memory of my relationship with my mother, his wife, I do not believe he would have received that– and mostly because of his own guilt and shame at how he treated her and their children. My father being removed from this life allowed me to truly embrace the truth that I “owned,” my personal story of my mother and me. I had a right to tell my story, regardless of concern for siblings. So I went through great lengths to truly “personalize” this story, leaving room for family members to say, “Well, that’s how Mark Anthony remembered it. I have a different recollection.” And that was okay with me. At the very least, my siblings agree that the attempt here was to honor our mother–give her the due of more dignity than despair. If the memoir, for you, is not about closure or resolve in understanding your upbringing, then what does this story mean for you? I believe each and every one of us has a story to tell. We share an equal worth in the family we call the universe. That one might want to tell their story for posterity, greater clarity and understanding, or simply to reminisce, it is all entirely valid. But I believe the impulse to tell our own story is as ancient as with all storytelling throughout the centuries. From cave paintings to the printed word, we tell our story to find meaning, purpose, in order to better connect to our rightful place in the universe. Our lives, our histories are much more than a series of random anecdotes, recurring scenes that haunt or give us joy. Our lives, our experiences add up to a larger, personal narrative–what has been our journey in this life and what will it be beyond this world? 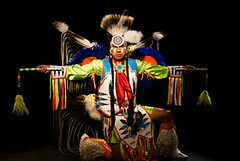 World Champion Fancy Dancer Larry Yazzie and the Native Pride Dancers perform this week at Stepping Stone Theatre in St. Paul. The Minnesota Book Award nominations are out, and the voting for the Readers’ Choice Award has just begun. The Minnesota Historical Society Press is happy to congratulate our three nominees and urge you to cast your vote for great Minnesota books. 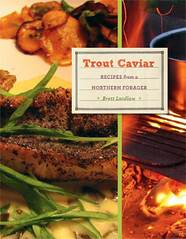 Trout Caviar: Recipes from a Northern Forager by Brett Laidlaw is nominated in the General Nonfiction category, and Anishinaabe Syndicated: A View from the Rez by Jim Northrup and Sisterhood of War: Minnesota Women in Vietnam by Kim Heikkila are both nominated in the Minnesota category. The Friends of the Saint Paul Public Library, sponsor of the awards, is also hosting the annual Readers’ Choice Event in a couple of weeks. You can meet Northrup, Heikkila, and some of the other finalists on Friday, March 16, starting at 7 p.m., at Open Book in Minneapolis (1011 Washington Avenue South). This event is free and open to the public. The evening will feature brief presentations by several of the authors, book sales and signing opportunities, plus a reception with wine, hors d’oeuvres and desserts. You have until the end of March to cast your vote. Hearty congratulations, as well, to Alan Kornblum, founder and senior editor of Minneapolis-based Coffee House Press, who is the recipient of the Kay Sexton Award in 2012. We’ll see you at the gala!